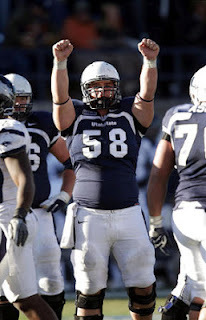 Utah State junior center Tyler Larsen has been named to the Centers of Attention list on the weekly report for the Rimmington Trophy Watch List. The Rimington Trophy is presented annually to the Most Outstanding Center in NCAA Division I-A College Football. 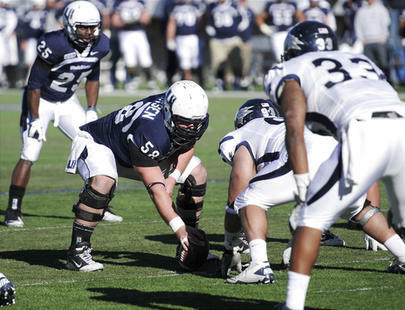 Larsen is one of four players to earn the honor for this week, joining P.J. Lonergan (LSU), Andrew Miller (Virginia Tech) and Jordan Rae (UCF). Larsen was named to the Rimmington Trophy Watch List for the second year in a row in July. He is the first USU player to be put on the list twice. Larsen is one of three Western Athletic Conference centers on the list, joined by Idaho's Mike Marboe along with Stephen Warner of Louisiana Tech. So far this season, Larsen has graded out of games at an average of 84.2 percent and 98.6 percent in covering assignments. He has averaged 5.6 knockdowns per game, with a career-high 10 at Colorado State. A native of Salt Lake City (Jordan HS), Larsen has started 30 consecutive games at center and is a Phil Steele's College Football Preview Magazine's Preseason all-WAC first-team selection. In 2011, Larsen was a first-team all-conference selection by not only the WAC, but by Phil Steele's College Football Magazine as well as the BCS Busters and College Sports Madness. Larsen made all the blocking calls and assignments in helping clear the way for the 2011 USU offense that established school records for total offense (5,945 yards), rushing yards (3,675), total points (437) and total touchdowns (60). USU led the WAC and ranked sixth in FBS in rushing offense (282.7 ypg), along with ranking second in the WAC and 20th in FBS in total offense (457.3 ypg). Utah State plays its third in-state opponent of the season this weekend as it travels to Provo to face BYU on Friday, Oct. 5 at 8:15 p.m., in a game that will be televised nationally on ESPN.